It is easier to see the signs when it is someone you know well. I am not saying they are always ‘slap round the face’ obvious. 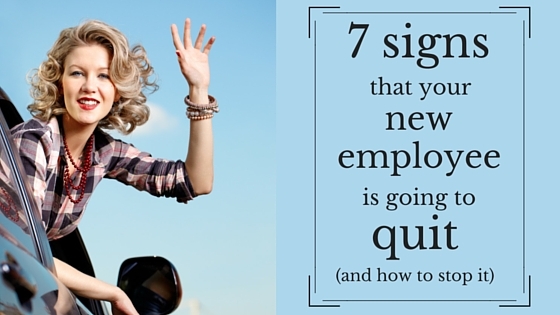 But the clues that your longer term employee is going to quit are definitely there. The opinionated team member who offers fewer constructive contributions in meetings. Who stops complaining about those little things that usually really wind him up. The ambitious self starter who no longer jumps at opportunities to work on new projects. He seems less interested in getting ahead and looks bored in training and development activities. The solid worker who is reluctant to commit to long-term projects. The one who has just started to do ‘enough’, who no longer goes the extra mile. You recognise these things because there is a change in normal behaviour. But how can you tell with an employee that you have just hired? But this is something we need to get smarter at. It has taken you weeks, maybe even months to get to the point that this job is filled. The hiring process has taken so much of your time, as did the training. And you are delighted that you can actually get on with the job you are paid to do. Just don’t forget to keep a careful eye on how your new hire is behaving. If the first you know about any discontent is when you receive their resignation letter, it is normally game over. The spark that you saw at interview is not there. You don’t sense any feeling of enthusiasm in them. They are going through the motions but they are just doing enough. They are not inquisitive. Everyone is different but it is unusual for people not to be curious about who’s who and what makes your business tick. They are not making any effort to bond with the team, to make friends. Perhaps they don’t want to create connections that will be difficult to walk away from. They are absent more than you would have hoped for. And perhaps their time keeping is not as precise as you would expect from a new hire eager to please. You can tell when someone feels like the days are endless and everything is a bit of a drag. We all have days like that. But it is not normal when they should still be in the honeymoon phase. They don’t really look you in the eye. Their smile is forced. They tell you everything is fine. Don’t push that nagging doubt away – you gut feel is probably right. They keep mentioning how everything was so much better at their old company. (Isn’t it really dull to be on the receiving end of those conversations?!) Normally new hires get the message after a while. But if they don’t, and you go beyond boredom to wondering why they even left their last company in the first place, it might be time to worry. If it is not, what are the expectations that haven’t been met? Can you fill that gap? This won’t stop all your new hires leaving. And when you do lose someone, it is time to sit down and think about why it went so wrong in such a short time. This is particularly important if this is not the first time someone has quit in the first few months. This is then more than individual people making individual choices. Do you identify the personality traits of the person you are looking for as well as the skills and experience? During the interview do you check for compatibility to the values that drive your business? Are you honest about the job? Do you sugarcoat the type of job it really is during the interview? Do you give them the opportunity to talk to one of their future colleagues? Do you do everything you can to get to know the person during the recruitment process? Do you think about the best selection process for each role so you can get to know them well? Do you know what they want the job to be like? Do you ask what they were looking for in their next role to see if this job is a good fit? Do you do everything you can to make them feel welcome? Is the first day and onboarding experience something they would tell their friends about (in a good way!)? Do you spend any time getting to know them prior to their first day? Do you, as their line manager, spend enough time with them? Do you do everything you can to make them successful? The truth is that they are some new hires that you won’t want to save. From time to time, bad hiring decisions are made by employers, and bad choices are made by employees. The way to avoid that is by focusing on what you really want during your recruitment process. Then you are more likely not to just find great people, but great people that are going to stick around. Next, give them an onboarding experience that leaves them with no doubt that they have made the right decision. And finally, keep an eye on them. Starting a new job is not always sunshine and laughter. There are inevitably days when it feels like the rain clouds won’t pass. Make sure you recognise these days and act fast so that the moments of doubt don’t become reasons to leave.